Regular appointments last an hour, although the initial appointment can take up to an hour and a half. The first appointment includes both chiropractic and CranioSacral Therapy evaluations, and helps determine appropriate treatment modalities. After evaluation, Dr. Lisa and the patient review together possible goals for treatment and anticipated number of sessions required. Since everyone's healing process is unique, criteria for treatment and evaluation of progress are somewhat fluid throughout the treatment process and can be revisited where necessary. Where appropriate, in cases where a patient's issues require it, appointments can be modified to fit individual needs. Customized programs can consist of 2 - 5 hrs/day and can be scheduled for one day or up to two weeks. This type of arrangement commonly involves long term, chronic problems that require focused attention and concentrated effort to break the pain cycle. All treatments are done in a relaxed environment, with the patient fully clothed and lying on a massage table. To book an appointment please call 561-746-5232. Chiropractic is a complementary health care modality that focuses on the nervous and musculoskeletal systems of the body. Any dysfunctions in these systems can create a variety of health issues. The main focus of chiropractic care involves enhancing spinal alignment of the vertebrae to relieve any subluxations which result in nerve pressure. Realigning the spine strengthens clear communication from the brain down the spine, and through the spinal nerves, to all parts of the body fed and controlled by those nerves. This same process also improves communication from the body back to the control center in the brain. Given the importance of nerve function for all bodily systems, chiropractic can contribute positively to the health of the entire body. It is also especially useful in the treatment of neurological and musculoskeletal conditions, including neck, back and hip pain, headaches, whiplash, numbness in the arms, hands and legs, injuries from auto accidents, sports injuries, and more. Spinal adjustments to mobilize and restore joint mobility are part of a session where their use is indicated. While chiropractic addresses the hard tissues, primarily bones and joints, CranioSacral therapy is a treatment of choice for soft tissues. The craniosacral system is a physiological system found within all animals that have a brain and spinal cord. This system forms the housing of the central nervous system. Its health therefore plays a vital role in the health of the entire body. The craniosacral system is made up of an extensive membrane system which covers the inside of the cranium, dividing the brain into compartments, and then covering the length of the spinal cord, ending with an attachment on the coccyx or tailbone. The membrane system holds the cerebrospinal fluid which bathes the brain and spinal cord and provides them with essential nutrients. The circulation of this fluid through the membrane system can be palpated as a rhythmic motion that spreads in subtle ripples through the body. Any obstructions within the membrane system or in the surrounding tissues can be felt as obstructions in this rhythmic motion. 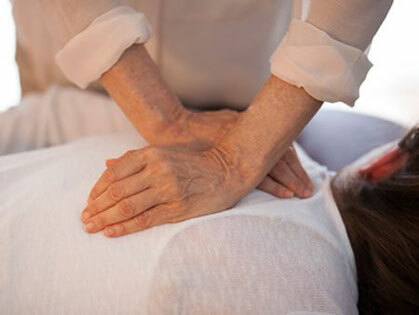 The craniosacral practitioner uses palpation of the craniosacral rhythm as a tool for diagnosing imbalances within the body, and then utilizes focused gentle stimulation of tissues to release imbalances and blockages and return the body to improved homeostasis. Treatment tends to be profoundly relaxing and can help address many conditions not effectively relieved by other treatment modalities. Acupuncture is an ancient healing system that originated in China. According to this tradition of Chinese medicine, there is a vital life force called Qi (or Chi) that travels through bodily pathways called meridians. Imbalance, illness and disease can result from any obstacle to the flow of Qi. Acupuncturists insert hair-thin needles at specific points along meridians to unblock the flow of Qi and restore greater balance. It can be useful to use acupuncture in conjunction with CranioSacral Therapy, as both therapies aim to release blockages and activate the innate healing capacities of the body. 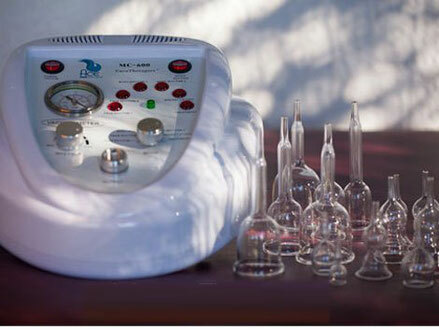 Vacutherapy is a modern healing technique based on the ancient practice of cupping found in traditional Chinese medicine as well as in other ancient cultures. A Vacutherapy machine creates a vacuum when placed against the skin, acting like a suction cup that decompresses layers of connective tissue from one another. In the process, vacutherapy increases blood flow, promotes rehydration of the tissues, helps eliminate debris built up from injury, etc. Vacutherapy contributes to detoxifying the tissues, clearing stagnation and dispelling waste and congestion that can result from inflammation and can cause ongoing pain. This cupping procedure also enhances lymph drainage and joint mobilization. Cupping can help release muscle spasm and tissue contracture, free up ligaments and tendons, reduce adhesions and scar tissue and remobilize fascia. Using cupping in conjunction with other modalities mentioned above can further speed up the healing process.